The origin of the Cyprus Numismatic Project can be traced back to an informal conversation in Edinburgh in 2003 between Professors Vassos Karageorghis and Keith Rutter. They discussed the island of Cyprus in antiquity, in particular the city-kingdoms of the Archaic and Classical periods. These cities issued coinages in gold, silver and bronze with different designs and inscriptions which constitute an important source of information for political history, art and religion at a time when Cyprus was part of the Achaemenid (Persian) empire. However, for a number of reasons this numismatic material was not currently realising its full potential as a research resource. There was currently no standard work on the coins and the "next best" works such as Hill1 or Head2 were woefully out of date. Researchers and students faced a basic problem when attempting to study scholarly work and opinions on Cypriot coins: the difficulty of access to the material. Specimens of the coins were scattered in public and private collections throughout the world, many of them inadequately published or not published at all; many other important coins were recorded in specialist auction catalogues; references to articles and books about the coins were likewise scattered across a range of periodicals and other printed materials. Without a specialist numismatic library at hand much of this information was effectively inaccessible. Professor Karageorghis suggested that there was scope for a project that would make specialist knowledge of ancient Cypriot coinage more widely available not just to an audience of scholars – numismatists, historians, archaeologists – but to members of the general public interested for whatever reasons in the history and cultures of ancient Cyprus. In the light of these facts – the outstanding importance of the resource and the hitherto specialized nature of its study – the question was, what could be done to remedy the situation? It was obvious that a project that would help to make this mass of material more widely accessible was needed, but what form should such a project take? To discuss this question, to establish what form(s) a project on the coinages of ancient Cyprus might take and to make progress in getting it off the ground, Professor Rutter went to Nicosia later in 2003. There he met with Drs Anne Destrooper-Georgiades and Evangeline Markou and Mr Andreas Pitsillides, who between them formed a talented and varied pool of experience of the coins and also in E. Markou’s case of substantial web experience. Together they quickly reached a number of fundamental decisions. First, with regard to the content of the project, it could not possibly cover every period of ancient Cypriot coinage; it would be necessary to confine it to the coinages of the kingdoms of Cyprus in the Archaic and Classical periods, that is, from the later sixth century BC to around 310 BC. Second, with regard to the form of the project, a website had the potential to be a far more comprehensive and generally more useful source of information than printed material ever could be. Such a format would permit the incorporation of a large amount of material – both coins and discussions of the coins – and would be a sustainable, flexible and easily supplemented instrument, allowing not only for the inclusion of material currently to hand, but also for adjustments, additions and changes as new information became available. By creating a web-based resource the project could bring together information about the coinages of the Cypriot kingdoms into a single location, simplifying the process of researching for its users. 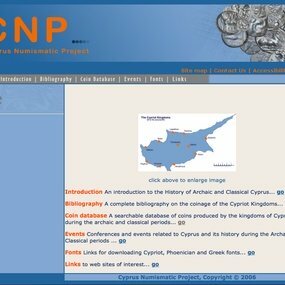 The CNP website planned to provide a comprehensive research resource on the coinages of the Cypriot kingdoms which would become the standard online guide for these coinages. Three main stages for its construction and content were envisaged, of which the first two were realised. The basic provision in the first stage was a complete bibliography of the coins of the Cypriot kingdoms. The compilation of such a bibliography was the responsibility of A. Destrooper-Georgiades. This fundamental element was supported by an additional short essay from her outlining the development and progress of Cypriot numismatic studies in modern times. The bibliography was also supported by an essay from E. Markou giving a general introduction to the history of the relevant period and the nature and general development of the coinages, with an overview of each of the separate mints in turn: Amathous, Idalion, Kition, Lapethos, Marion, Paphos, Salamis. In parallel E. Markou proposed the concept of the website and created the site map together with the initial logo and the website itself, which was hosted by the University of Edinburgh [Fig. 1]. Initially the website included the bibliography (organised in thematic sections and presented to visitors to the website as a pdf file), and also the introductory essays by A. Destrooper-Georgiades and by E. Markou noted above. The second stage of the project concentrated on the transformation of A. Destrooper-Georgiades’ bibliography into a searchable database, which would be searchable online via the CNP’s updated website. Users would then be able to search bibliography by general theme, by author or by year of publication, among other possibilities. 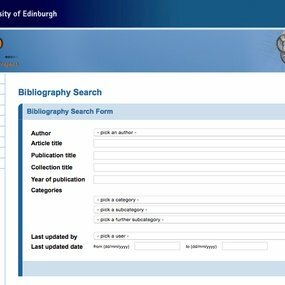 The schema for the bibliographical database was created by members of Edinburgh University Computing Services and a new website in the School of History, Classics and Archaeology at the University hosted the updated information [Fig. 2]. The third and final phase of the CNP would include far more information, such as the digital recording of images of, and information about, relevant coins in public and private collections and auction sales catalogues, the construction of a coin database and the linking of the two databases (bibliography and coins). In addition to the above the website would also contain an introduction to the fonts (Cypriot-Syllabic, Phoenician and Greek) used on Cypriot coins, and links for example to other coin databases and to other projects on Cypriot antiquities, and to events such as seminars, conferences and workshops. Thus the total contribution of the website would be far more important than the sum of its parts. It would be searchable in such a way that all the above-mentioned collections of information – bibliography, essays, images of coins – would be linked. Preparations for the third stage were made by the collaborators in the CNP, for example by providing a first structure for the coin database and by initiating enquiries to curators of museums with regard to Cypriot coins in their care. Funding for this stage was not forthcoming and so the project was halted in 2008. The financial support of the A.G. Leventis Foundation and of the Bank of Cyprus Cultural Foundation was crucial both for the setting up of the CNP and for the successful completion of the first two stages of the project. This support enabled us to create a website to host the project as a whole, and to prepare a structure for the coin database. In Edinburgh, Hamish MacAndrew and Sue Coleman of "Edinburgh Research and Innovation" gave freely of their time to help us at various stages to formulate our strategy and to shape our applications for funding. Also in Edinburgh, Ed Dee, Alan Sloan, Anand Sengodan and Arthur Wilson of "Edinburgh University Computing Services" guided us through some of the more technical aspects of building a website. At a later stage Andrew McFarlane and his colleagues at EUCS worked with E. Markou to make the online bibliography searchable. I am proud to have been associated with the Cyprus Numismatic Project and to have been given the opportunity to record here that we were able to complete the first two of its projected stages and to lay the groundwork for the third stage. What has been acquired in the years dedicated to the CNP will be exploited since both the bibliographical database and the essays related to the bibliography has been updated and moved to a new "home" in the SilCoinCy Project’s website dedicated to the history, archaeology and numismatics of Ancient Cyprus. In the course of her application for funding in 2012 E. Markou contacted me to ask if I was willing to permit the incorporation of the CNP’s bibliographical database in the proposal she envisaged, on the basis of her long study of the gold coinage of the kings of Cyprus (beginning with her Ph.D. thesis) and her experience of a web-based project such as the CNP. My response was positive because this would mean an opportunity for the revival and moving forward of an older project to a new home. Fig. 1: First version of the CNP's website in the University of Edinburgh. Fig. 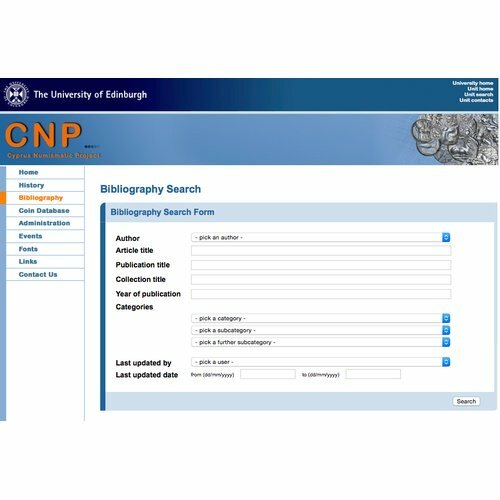 2: The bibliographical database of the CNP's website in the University of Edinburgh. Head, B.V. 19112: Historia Numorum, London. Hill, G.F. 1904: British Museum Catalogue of the Coins of Cyprus, London. Web address of CNP: http://www.cnp.ed.ac.uk.